No, these aren't made with buffalo meat -- they just taste a lot like Buffalo wings. AWESOME!!! In a large bowl, thoroughly mix all ingredients. Evenly form into 4 patties. Bring a grill pan (or large skillet) sprayed with nonstick spray to medium-high heat. 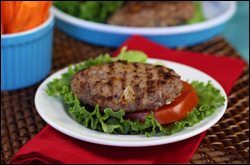 Working in batches as needed, cook patties for 4 - 8 minutes per side, until cooked to your preference. Enjoy! 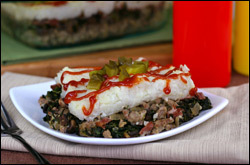 This is like the love child of shepherd's pie and a cheeseburger... and we're crazy about it. AHHHHH!!! Preheat oven to 400 degrees. Spray a deep 8" X 8" baking pan with nonstick spray. Bring a large pot of water to a boil. Meanwhile, peel and cube the potato. Add potato and cauliflower to boiling water. Return to a boil, and reduce heat to medium. Cook until potato and cauliflower are very tender, 15 - 20 minutes. Drain water and transfer potato and cauliflower to a large bowl. Add butter and 1/4 tsp. salt, and thoroughly mash. Bring a large skillet sprayed with nonstick spray to medium-high heat. Cook and stir mushrooms and onion until softened, 5 - 8 minutes. Add spinach and pepper. Cook and stir until spinach is warm, about 2 minutes. Transfer veggie mixture to another large bowl. Blot away any excess moisture. Remove skillet from heat. If needed, clean skillet. Re-spray with nonstick spray and return to medium-high heat. Add beef and sprinkle with remaining 1/4 tsp. salt. Cook and crumble for 5 - 8 minutes, until cooked through. Remove skillet from heat. Add mustard and cheese wedges, breaking the wedges into pieces, and stir until cheese has melted and is well mixed. Chop or crumble bacon. Evenly layer ingredients in the baking pan: beef mixture, veggie mixture, bacon, and potato-cauliflower mixture. Bake until top layer is firm, 20 - 25 minutes. Sprinkle with pickles, serve, and enjoy! 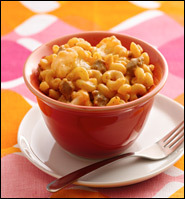 Cheeseburger Mac Attack - People, it's macaroni & cheese that tastes LIKE A BURGER. You can't go wrong. Cheeseburger Tacos - That's right. We went there. Crunch it up! Cheeseburger Mashed Potato Parfaits - Not only are these savory parfaits tasty and cute, but they're also vegetarian-friendly. The Cheeseburger Chomp - Who says a burger needs a bun? We wrapped ours up in a high-fiber tortilla! We doubt the Hamburglar himself is in your social circle, but we bet you know MANY people who love cheeseburgers -- click "Send to a Friend" now.